Though we’ve climbed our share of mountains, we’d never ascended one like this. Instead of trudging uphill for days in boots and backpacks, my brother Dan and I didn’t even break a sweat in the hour it took to reach a snowy peak with an eagle-eye view of four countries. Our trick was choosing Zugspitze, Germany’s highest mountain, which boasts rail and gondola access to the very top. While our ears popped, we passed effortlessly from a green and wooded valley into a long tunnel through solid rock before emerging on a high glacier, thanks to the Zugspitzbahn train. From there, only a short gondola ride separated us from the resort-like summit station. After treading a short path to the 9,718-foot peak, we took in an awesome view of more than 400 snow-capped peaks extending farther than the eye could see into Germany, Austria, Switzerland and Italy. Then from the nearby viewing deck, we took in an awesome amount of wienerschnitzel and beer. Descending, too, was a dramatic departure from our usual mountaineering experiences. Zugspitze's summit is the highest peak in Germany. Mountaineers know returning from a summit can be as arduous as climbing up to its peak. From the Zugspitze summit station, most visitors take the gondola down to the beautiful Eibsee Lake. Many of them thank their maker upon arriving there, I’ll bet. Standing beside the cable car’s large windows, riders experience the full heart-pounding excitement of dropping some 6,500 feet in mere minutes. As we flew down over ice, jagged rock and endless tree tops, I gripped the gondola’s railing with white knuckles and counted the seconds until our touchdown. More challenging adventures also await hikers and climbers here. 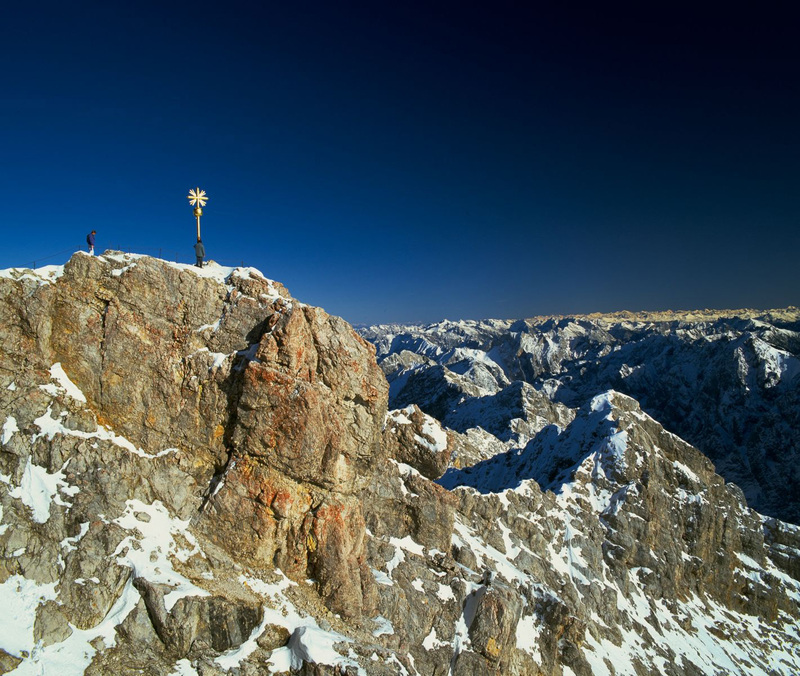 Trekkers push to the mountaintops from the nearby towns of Garmisch in Germany and Ehrwald in Austria. Some climb the mountain with crampons and ice axes. Several mountain huts feed and shelter visitors on the way, providing unforgettable camaraderie and a taste of German culture. 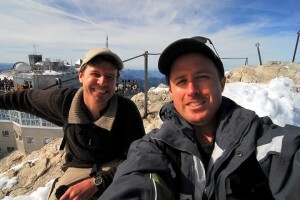 Matt Johanson and Dan Johanson atop the highest peak in Germany. In addition, Zugspitze in winter becomes a prime skiing destination for both downhill and cross country enthusiasts. In fact, Garmisch and neighboring Partenkirchen will host the 2011 Alpine World Skiing Championships. For another excellent outdoors experience near Garmisch, take a walk through the breathtaking Partnachklamm, a rock gorge half a mile long and hundreds of feet deep. Over thousands of years, the Partnach River carved the chasm through limestone. German loggers long used the waterway for easy transport of felled logs. Now an easy path leads visitors by its crashing waterfalls and deep bubbling pools. This is another attraction that shows a different face in winter, with spectacular snow and ice formations. History buffs will take interest in Jagdschloss Schachen, the magnificent hunting lodge of Bavaria’s King Ludwig II (1845-1886). Attractive though ordinary from outside, the magnificent and opulent interior is worthy of a monarch. One imagines that Ludwig, who incurred heavy debts to build extravagant castles throughout his country, would have it no other way. 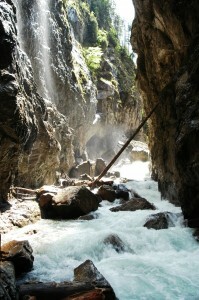 Partnachklamm makes a worthy hike. “The Fairy Tale King” also built Schoss Linderhof about 16 miles from Garmisch by bus. A small palace by Ludwig’s standards, Linderhof nevertheless shows the sheer decadence that surrounded absolute monarchs of his time. The king’s minions labored to redirect a stream to make an artificial waterfall flow outside his bedroom window, cooling the room in summer. When he visited the castle, Ludwig himself ate from a dining board that mechanically rose into the dining room, so his servants below could serve their reclusive liege without being seen. Royal lavishness provides a few interesting sights, but Dan and I visited Garmisch to experience the Alps, and another adventure awaited us on the Wetterstein Range. We arranged to meet a pair of paragliders beneath the nearby Osterfelderkopf mountain. Together we rode another cable car to its upper station near the summit. There the two master flyers laid our their gliders on a steep hillside while Dan and I put on harnesses. We divided into pairs and fastened ourselves securely together. “Run, run, run, run, run,” instructed Tobias Dippon, my guide. And so we did, tearing down the mountain a dozen steps until our feet treaded air. A half-hour of airborne ecstasy followed. For those who enjoy the mountains, flying gently over them is a rare privilege. Our guides were skilled, friendly and conveniently fluent in English. They were also happy to facilitate photography, and the flight generated priceless pictures. As an outdoors purist, I can’t say I’d like to see many mountains developed for tourism as the Germans have done with Zugspitze. But there’s something to be said for opening up an alpine experience to a broader group than the usual rugged and ragged climbing and hiking crowd. Finally, those who want to visit should consider going soon. The Zugspitze glacier, like so many in the world, is shrinking. Getting there: Garmisch is about 90 minutes from Munich by rail; trains leave hourly. Bavarian rail offers a great deal for groups traveling within this southern German state: up to five passengers can ride for a day on a single ticket for only 27 Euros. Zugspitze: A round-trip train and gondola ticket costs 47 Euros in summer. Cheaper tickets are available for lower peaks. Visit www.zugspitze.de. 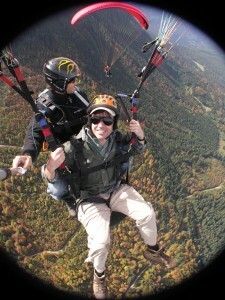 Paragliding: Find guides and flight information at www.fly-garmisch.com. Prices run from 75 to 100 Euros. Lodging: Hotel Schell is comfortable, affordable, and a short walk from the central train station. Double rooms start at 30 Euros per night; an all-you-can-eat breakfast is 5 Euros more per person. Visit www.hotel-schell.de. For a more upscale experience with better mountain views, try the Hotel Garmischer Hof. Double rooms here start at 94 Euros per night, including breakfast.